Note: the following is not a parody. It is absolutely true and made me wonder if I’d stepped through a door into another dimension. The ADC wants any “American who traces his or her ethnic roots to one of the countries in the Arab World, including Algeria, Bahrain, Djoubti, Egypt, Iraq, Jordan, Kuwait, Lebanon, Libya, Mauritania, Morocco, Oman, Qatar, Somalia, Saudi Arabia, Sudan, Syria, Tunisia, United Arab Emirates, and Yemen” to be eligible for MBDA services. Palestinians would also be included. The ADC lists such things as Arab names on no-fly lists as well as “harassment and racial profiling” as placing Arab-Americans at a disadvantage in business. Are Arabs economically disadvantaged since 2001? Not measurably. Per Capita income for individuals reporting their ancestry as one of several Arab nationalities in 1999 was $24,061 ($31,492 in 2010 dollars), which put them just below the middle of the list. In 2010, it was $30,039 and their position on the list was precisely the same. To put things in perspective, per capita income for all Americans reporting themselves as white in 2010 was $32,126 while African Americans received $18,342 and Hispanics only $15,638. Arab Americans are doing just fine. As far as non-economic discrimination is concerned, in 2010 the FBI reported that 67% (1040) of religion-based hate crime victims were Jews, while only 12.7% (197) were Muslims. If we assume that there are about 3 times as many Jews as Muslims in the US, we can conclude that a Jew is almost twice as likely to be a hate crime victim than a Muslim. Of course nobody thinks an affirmative action program is needed for Jews. On the other hand, maybe this is a program for Jews. After all, “Palestinians” are included, and we can trace our origins to the Land of Israel, sometimes called ‘Palestine’. And that is more than many so-called ‘Palestinians’, whose ancestors migrated from Egypt or Syria in the 19th and 20th centuries, can do! Yesterday I described how Iran was making fools of the West, and why Israel cannot depend on the US to protect it. Altogether, the regime has treated the West the way a shark would a squid: with the combination of appetite and contempt typically reserved for the congenitally spineless. The Iranians may also be gambling that any Israeli strike will prove costly, unpopular and ineffectual, thereby tagging Israel as the aggressor while crippling its deterrent power in the long run. That’s more of a gamble, but from the Iranian perspective it may be one well-worth taking. It is indeed a big gamble, taking on the Israeli Air Force and special forces. But on thinking further about it, it may not be as crazy as it looks. Analysts agree that a strike against the Iranian facilities will delay, not prevent, the attainment of nuclear weapons. They also agree that the capabilities of Israel are more limited than those of the US. There is also the fact that Israeli leaders will hold back in order to avoid civilian casualties. It is possible that the Iranians think that they can keep enough highly enriched uranium and other equipment safe from an Israeli attack that the delay in their program would be a matter of months rather than years. Keep in mind that we do not have perfect intelligence about the amount of uranium and its degree of enrichment that they have stockpiled. Once Israel attacks Iran, it can respond with the full force of its own missile arsenal and Hizballah’s. Coordinated attacks, which could include a Palestinian uprising, could do serious damage to Israel’s economy and morale. On the diplomatic front, Israel would be branded as the aggressor, the US would be furious, and probably Israel would not be given an opportunity to strike a crushing return blow at Hizballah and Iran. This is an old schoolyard trick: get your opponent to hit you, then hit him as hard as you can and fall down crying as adult supervision approaches. Is this a likely scenario? Who knows? One way to counteract this strategy is to pull Iranian teeth in advance by a broad-based attack on Iranian military and IRGC assets, rather than a simple surgical strike on the nuclear facilities. It would be necessary to hit both Iran and Hizballah. The question is whether Israel has the capability to do this with her conventional forces. I’m glad that I’m not a member of Israel’s Security Cabinet, which has to take decisions like this. P5+1: We’ll reduce sanctions if you stop enriching uranium. 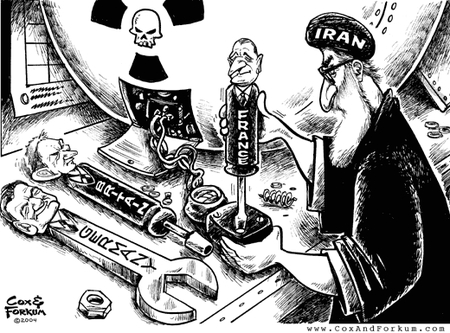 Iran: How about we enrich uranium and you reduce sanctions? Another meeting has been set for July 18. Ho hum, almost another month, more uranium enriched to (at least) 20% and the Fordow facilities get more centrifuges and become more difficult to hit. I suppose that ultimately the P5+1 will get tough, and ‘force’ Iran to agree to something more substantial than yet another meeting date. But since their initial bargaining position was considered by many (including Israeli PM Netanyahu) inadequate to prevent Iran from preparing a “fast breakout” position in which weapons could be built on short notice, how much less adequate will the final deal be? For now, the crucial question is whether even an interim, time-buying deal is possible. The administration’s optimism was based on the notion that Iran would agree to cease its most advanced form of uranium enrichment, export the stockpile of that material to the West and stop operations at Fordow in exchange for several Western concessions, like the supply of spare parts for commercial aircraft and fuel for a reactor that produces medical isotopes. In Baghdad, Iran rejected that deal as one-sided; it appears to expect major sanctions relief in exchange for any freeze of advanced enrichment. Who is buying time here, of course is Iran — or rather, it is being given to them gratis. The sanctions and concessions that are on the table are ludicrous, given the fact that acquisition of nuclear weapons has been among the most important objectives of Iranian policy for decades, one to which enormous resources have been dedicated. Imagine trying to induce the US to drop the Manhattan Project in 1944! It is a good bet that the only way to stop Iran today is by force. A European oil embargo is scheduled to go into effect on July 1, but even that will leave loopholes. And there are other markets for Iranian oil, like Turkey and of course China, Japan, India and South Korea. While the Iranian nuclear program is a problem for the US and for Israel, it is both more serious and more urgent for Israel. The Obama Administration sent diplomat Wendy Sherman to Jerusalem on Friday to “reaffirm our unshakeable commitment to Israel’s security.” And no doubt to deploy various carrots and sticks to keep Israel from taking matters into its own hands. Eisenhower’s 1956 promise to keep the strait of Tiran open was not honored by LBJ in 1967. In 1991, G. H. W. Bush promised to destroy the Scud launchers in Iraq if Israel stayed out of the conflict. Israel stayed out, but the Scuds continued to fall on Tel Aviv. During the Oslo period and the Second Intifada, Israel made numerous serious concessions and withdrawals in the name of peace, while the Arabs didn’t budge. Rather, Arafat started the Second Intifada and Hamas rocketed southern Israel from Gaza. Yet Western diplomatic pressure and condemnation of Israel increased. The UN Security Council passed resolution 1701 to end the Second Lebanon War in 2006. It called for UN forces to block Hizballah’s return to South Lebanon, to interdict arms shipments from Syria and to disarm Hizballah’s militia. None of these things happened, and Hizballah has refortified South Lebanon and rearmed with weapons delivered through Syria. The 1994 letter to then-PM Sharon from George W. Bush, which said that a “full and complete” return to 1949 lines and the settlement of Arab refugees in Israel were not “realistic,” was disavowed by the Obama Administration. President Obama began his Mideast policy with a speech in Cairo in which he compared the Holocaust to Palestinian suffering in pursuit of a homeland. Then he adopted the position — more extreme than that of the Palestinians themselves at the time — that any Israeli construction outside of the Green Line was an ‘obstacle to peace’, and in March 2010 orchestrated a break with Israel over the announcement by a local authority of plans to build apartments in an existing Jewish neighborhood in Jerusalem. Obama then summoned PM Netanyahu to Washington and abandoned him in a White House conference room while he went to have dinner with his family. There were no photo-ops; the whole affair seemed designed to humiliate the PM in a way which was unprecedented. In May of 2011, Obama produced a “peace proposal” which moved US policy significantly closer to the Arab position and away from Israel. If implemented, it would be a disaster for Israel. Netanyahu was on a plane to the US when the speech was delivered, and he did not receive a heads-up beforehand. If you were PM Netanyahu and were deciding whether you could entrust the West in general, and this US administration in particular, with the physical survival of your country, what would you do? Due to poor intelligence the Israelis were not prepared for a violent reception, and actually landed on the deck carrying paintball guns and stun grenades. These ‘weapons’ had no effect on the IHH militants, and soon the Israelis found themselves in danger of their lives. Several were seriously injured. At this point they drew their deadly weapons and fired in self-defense. Nine of the IHH members were killed and one critically injured. A UN commission ruled that the blockade and enforcement thereof were legal, but that Israel used ‘excessive force’. Since the alternative to the said use of force would have been the death of the Israelis, it’s hard to see how they could have done otherwise. Of course this is the UN, and the fact that they found the blockade itself legal under international law is remarkable. In any event, the Turks were and are furious. 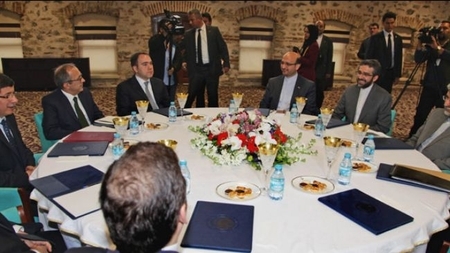 The indictments will reportedly include a demand for 10 life sentences for each officer for their involvement in the deaths of the nine Turkish citizens and the critical injury of a tenth citizen, who was left comatose. Israel supposedly offered to compensate the families of the dead and express ‘regret’. But the Turks want an admission of guilt. Which they are not going to get, at least not from the Netanyahu government. There is good reason to think that the Mavi Marmara affair was orchestrated at the highest levels of the Turkish government, in order to embarrass Israel and to weaken, if not break, the blockade. And in this it was successful, insofar as the US response was to force Israel to end the embargo on goods (except for actual military-use items) into Gaza, ending Israel’s attempt to bring down the Hamas regime by economic means. But there is more to it than simple diplomatic warfare. Turkish pride implies that it is absolutely unacceptable for a Jew to kill a Turk, under any circumstances. Indeed, this is an issue in the Arab and Muslim world generally. The Islamic principle of Muslim superiority is damaged — the world is turned upside down — when Muslims are defeated in warfare by Jews, Christians or infidels. So the fact that the Jews of Israel have beaten their Muslim enemies consistently since 1948 is infuriating and intolerable to them. This is one of the reasons that the kind of compromise peace plans offered by the US and the Israeli Left are consistently rejected by the Arabs. The only end to the conflict acceptable to their ideology is a total surrender by the insouciant Jews. This is why Yasser Arafat chanted “with blood and with spirit we will redeem you, Palestine.” For Arafat, only blood would do. The Arab (or Saudi) Initiative illustrates the Arabs’ need to restore the balance of the world. It requires Israel to take full responsibility for the conflict, accept an Arab majority, and place itself under Arab ‘protection’. As long as Islamic ideology is ascendant in Turkey and the Arab nations, I don’t expect a rapprochement between Israel and its neighbors. The continued existence of the Jewish state will depend on its military superiority, and upon the weakness of its enemies stemming from the division and conflict in the Muslim world. Some days it seems that nobody gets a worse press in the US than Prime Minister Netanyahu. Israel’s left-leaning media and academic establishment hate him with a grand passion, they are articulate, speak English, and understand the importance of telling their story here. They are happy to cooperate with their counterparts in the US media, and often with the White House and State Department, where Bibi is seen as an obstacle on the road to a 1949-sized Israel. So Netanyahu is often presented in the US as a symbol of right-wing intransigence or worse. 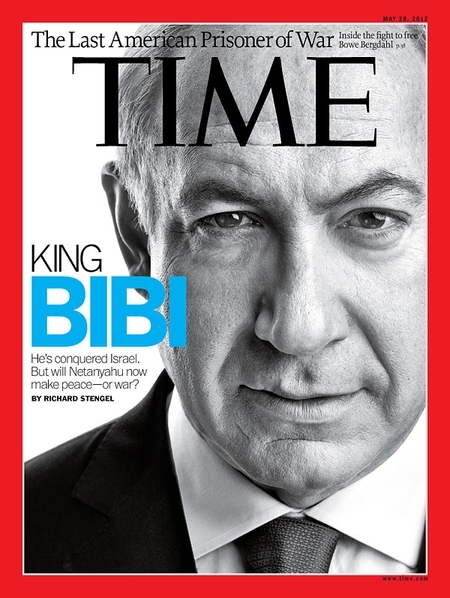 But Time Magazine, which once helped us pronounce “Begin” by saying “rhymes with Fagin,” and whose cover much more recently explained “Why Israel Doesn’t Care about Peace,” has published a story (Bibi’s Choice, by Richard Stengel [subscription]) which is mostly positive about the PM, despite its overall silly slant: “Will Netanyahu now make peace — or war?” the cover asks, as if ‘making peace’ were something an Israeli leader could do if he just chose to do so! When I became Prime Minister, I asked [my father] What attributes does one need to lead a country? He was older then and he asked me, What do you think? I said, You need convictions and courage and the ability to act. He said, You need that for anything. He then said what you need to lead a country is education, and by that he meant an understanding of history, the knowledge to be able to put things in perspective. We will preserve Jerusalem because an Israel without Jerusalem is like a body without a heart. It was on this hill, 45 years ago, that the heart that unites our people began to beat again with full strength; and our heart will never be divided again. Unlike his predecessor Olmert (probably the worst PM Israel ever had), Netanyahu is not “tired of winning.” He understands, as Olmert did not, that the alternative to winning is disappearing. While not a coronation, the recent coalition deal provides Bibi with much more freedom to maneuver. And despite what the noisy remnants of the Israeli Left say, most Israelis give him their support. He will need every bit of it to get Israel through what may be the most dangerous period in its history since 1948. Perhaps it will also finally persuade the American media to take him seriously.